Kampot is one of Cambodia’s culinary hot spot with a surprising range of options for such a small town. 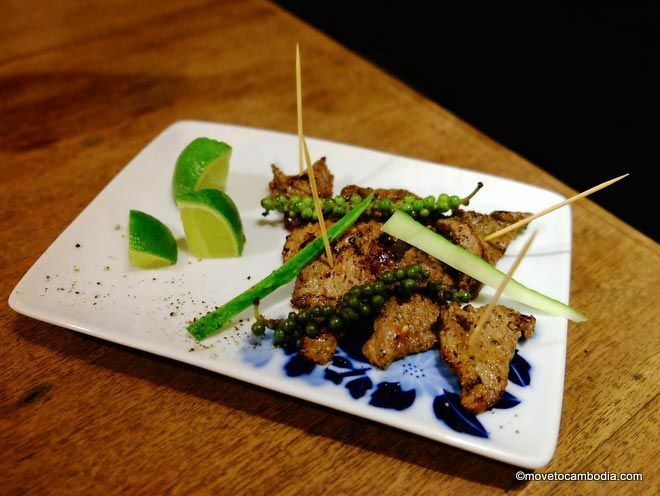 The Kampot pepper beef at bARACA will make you not want to share. This Belgian-owned tapas bar serves inventive, surprisingly delicious takes on Spanish tapas influenced strongly by local flavors and products. This was some of the best food we’ve had in Kampot in a long time, and from a first-time restaurateur to boot. Try the bisch kampot, beef with pepper-lime sauce, strewn with fresh green peppercorns on the vine, and the holy squid, marinated in a deeply flavorful sauce and cooked up with fistfuls of holy basil — mop up the squiddy juices with lightly toasted baguette slices and you may be unable to keep a contented sigh from escaping your lips. Grilled pepperoni pinxto with pickled chilies was also compulsively eatable. The space has an appealingly eclectic minimalism, with mixed table sizes and heights, mustard yellow walls, and old Chinese biscuit tin light fixtures. The bar serves up a few kinds of crisp, bubbly cava, considered but somewhat pricey cocktails — try a passionfruit daiquiri when it’s in season — homemade limoncello, and Cambodia beer on tap. The gazpacho bloody marys are nothing less than addictive. One particular delight is the Baraca “dessert” — a shot of Thai rum paired with a sweet Indonesian clove cigarette. Skeptical? We were, too, but it’s a great way to end a meal. Cava goes for about $3 a glass and $14-17 a bottle, and tapas will run you around $1.50 to $3 per order. Order four to share for a light meal. Baraca also offers a few sunny, inexpensive guestrooms. Read our full review of bARACA Rooms here. Open daily, 5:30 p.m. to 10:30 p.m.
Kampot Espresso predictably has the best coffee in town, but also an outstanding breakfast and lunch menu. True coffee nerds will know they’re in the right place upon seeing Cafe Espresso’s menu introduction — “Sorry, we don’t serve ‘regular coffee. '” Arguably the best coffee in Cambodia, Cafe Espresso serves up a wide range of expertly prepared European and Australian-style espresso drinks, pour-overs, siphons, and even one of our favorites, the humble Aeropress. The cafe, which opened in 2011, sources regional coffee beans and roasts them in-house daily, for a strong, flavorsome coffee perfect for milk-infused espresso drinks. If that weren’t enough, Cafe Espresso serves breakfast and lunch, and the food is fantastic. Particular standouts include the housemade muesli, with rolled oats, crispy rice, nuts, goji berries, candied lotus seeds, and rosella, served with yogurt and fresh tropical fruit, and the savory herbed corncakes with poached eggs, a fantastic fresh chile-spiked salsa, and sweet-smoky tomato jam. Lunchtime features simple, satisfying fare like pulled pork sandwiches and burgers, and many of the cafe’s dishes feature surprising middle-eastern flavors, like harissa. Check for daily specials. The Australian owners are welcoming and happy to dole out sightseeing recommendations, and the cafe is family-friendly, with a no-smoking policy indoors. The free wifi, large wooden work tables, and comfortable old shophouse style make this an ideal place to hunker down for a few hours with a flat white and a laptop. 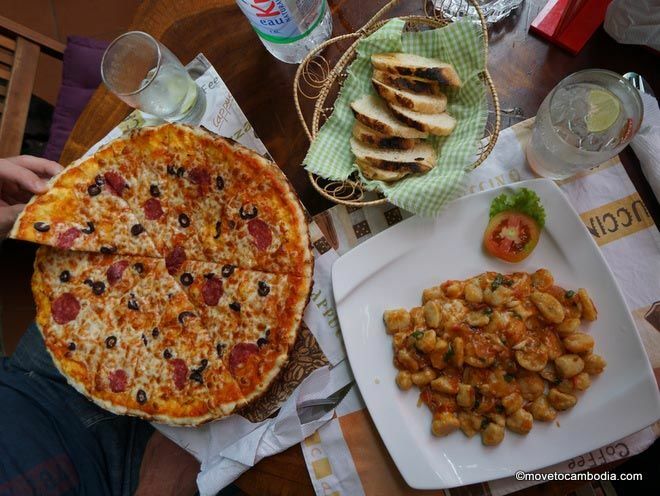 It’s true that lots of restaurants in Cambodia serve pizza and pasta, but none of them match Divino. Divino Italian Restaurant and Pizzeria doesn’t seem like much from the outside. The tiny restaurant has little in the way of ambiance and only a few tables, which can result in excruciatingly long wait times. But the food makes it all worth it; the place serves some of the best food in Kampot. The owners, Marco and and Alessia, moved to Cambodia from their native Italy, where Marco worked as a chef for several decades. And he knows what he is doing — the Italian pastas and pizzas are superb. The daily specials offer a range of Italian specials that far surpass the usual spaghetti bolognese found on the menu of what feels like every restaurant in Cambodia. The fresh-made gnocchi was a particular standout, so light and pillowy it was hard to believe we weren’t in Italy, and the thin-crust pizza is superb. Get your dumpling on (or your hand-pulled noodle on, I suppose) at Ecran noodle house. Ecran has moved to a new riverside location in front of Rainbow Bridge Hotel, but apart from the view, not much has changed. 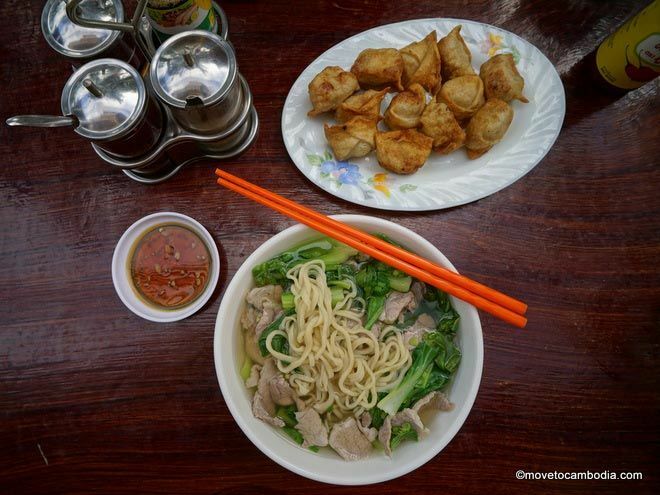 This casual noodle house serves up delicious dumplings — pork or veggie, fried or boiled — and hand-pulled Chinese noodles either fried or in soup. It’s always to decide between hand-pulled noodles and dumplings, so we suggest you get both. If you come at the right time of day, you’ll get to watch the noodle-maker at work stretching out pounds and pounds of noodles. Dumplings are $2.50 for 12, and noodle soups $2.50, and beers are $1. Ecran Noodles used to be attached to Ecran Movie House on Old Market Street (Street 724). While they are now in separate locations, they are still under the same ownership. This means that if you want to rent a movie from one of the hundreds on offer and watch it in one of the four private, air conditioned screening rooms (two are nonsmoking, and one can fit up for 40 people, with a 157-inch screen), you can get noodles and dumplings delivered. Movies are $3.50 per person, per movie. Tertúlia serves authentic Portuguese food, professionally plated in a way that would never have been seen in the Kampot of yore. The menu is filled with fish and seafood dishes, including Bulhao Pato clams, octopus salad, and the traditional Portuguese slow-cooked seafood dish, seafood cataplana. Meat eaters need not worry, though, steak mirandesa and beef cheeks in a red wine reduction are also on the menu. Mains cost between $7.50 and $12.50, and they also have a nice selection of Portuguese wines. The restaurant is excellent by Kampot standards, but our gritty clams reminded us that we’re still out in the sticks. A meal for two goes for around $40, depending on how much Portuguese wine you imbibe. Be warned that it’s cash only. Epic Arts Cafe offers delicious, inexpensive food for a good cause. 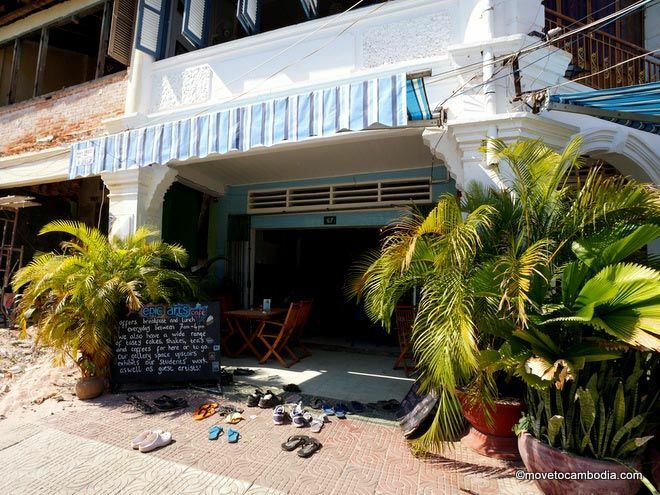 The Epic Arts Cafe is one of the most popular eateries in Kampot, and with good reason. Part of the Epic Arts inclusive arts NGO, the cafe was created as a place to employ differently abled young people and was envisioned as a hangout for deaf students. They might not be able to get a table, though, because the place is always packed, and when we visited there was a line out the door. The cafe is open for breakfast and lunch with a simple but delicious menu of healthy international specials, salads, bagels, and paninis. We tried the bagel with hummus and olives, sweet corn cakes with tomato salsa, and grilled barracuda with mango salad, and each was delicious. Because most of the staff are deaf, ordering is done by paper and pencil, and it must be said when we were there the cafe was woefully understaffed. But the food more than made up for it, and the prices, with mains between $3 and $4.50, were very good value. We stumbled across Twenty Three during their soft opening, but already they were packed with bearded and tattooed 20-somethings. The place is very much a hipster restaurant (right down to the menu font), but in the best possible way. At Twenty Three they make their own pickles and serve salted caramel desserts, braised pork belly, and classic cocktails — all delicious evidence of their hipster bona fides. But more important, the food is very good and reasonably priced. The menu is small and changes regularly, with daily specials that depend on the mood of the South African chef. The standout for us was the smoked mackerel pate, served with whole-wheat toast and cucumber pickles. Prices are between $4 and $6, and there’s also a bar with a nice selection of cocktails, including negronis and Manhattans as well as more exotic concoctions. Open daily, 9 a.m. to 11:45 p.m. 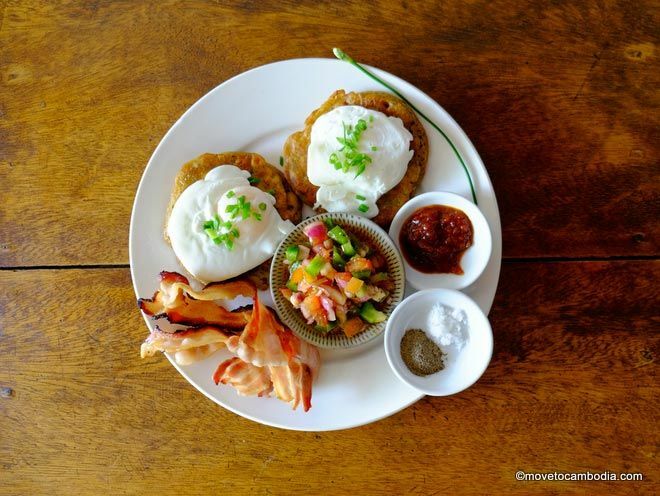 If you’re after a Western breakfast or a Thai dinner, try the Loving Spoonful. The Thai-Swiss couple who own the Loving Spoon have come up with a unique way to divide the labor of running a restaurant. 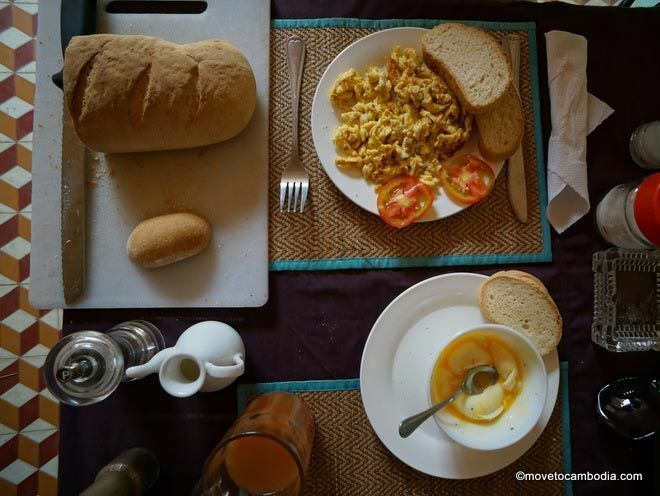 In the morning, Lukas prepares Western breakfasts that are raved about all over town. And in the evening, his Thai wife, Aom, makes what is roundly agreed to be the best Thai food in Kampot. The menu is simple and inexpensive — in the morning eggs and coffee are served with a loaf of homemade bread that you can take as little or as much of as you like, and in the evening there’s a selection of Thai dishes costing $5 or less, which can be made authentically spicy or less so, at your request. Open daily except Thursday, 7 a.m. to 1 p.m. for breakfast and 4 p.m. to 9 p.m. for dinner. The Rusty Keyhole is no more, but the Rusty Keyhole lives on. Whereas the former were known for ribs, the latter has made a name for itself with their Sunday roast. The sports bar offers inexpensive Sunday roasts, including roasted lamb with mint sauce, roasted local pork with applesauce and crackling, and roast beef with horseradish sauce, all made with imported Australian meats. Each meal comes with roasted veg, mashed and roast potatoes, two Yorkshire puddings and gravy and costs between $4 and $7.50. Add Brussels sprouts for $1. Get to Rusty 2 early on a Sunday because they tend to sell out in just a few hours.